At the young age of nine, Theagenes of Thasos became famous throughout Greece. It seems the boy was walking home from school, when he noticed a bronze statue of a god in the marketplace of Thasos. For some, strange reason, but probably out of admiration, Theagenes tore the statue from its base and took it home. This act outraged the citizens, who perceived it as highly disrespectful, and they debated whether or not they should execute the child for his deed. One elder, however, suggested that they have the boy return the statue to its proper place. Theagenes did this, his life was spared, and word of this amazing feat spread across Greece. 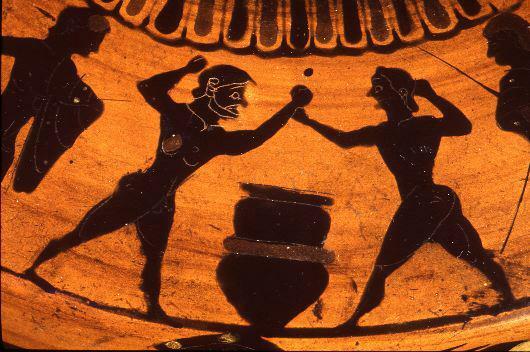 At the 75th Olympiad, Theagenes had designs on winning both the boxing prize and the pankration prize. Side A: boxer at right. 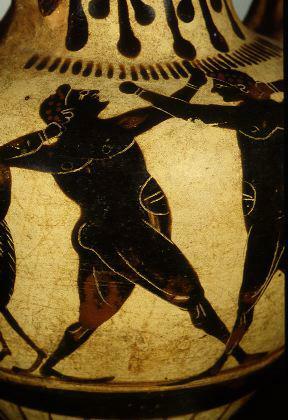 After defeating the boxer Euthymos, Theagenes was too tired to win a second crown for the pankration. Interestingly, the judges fined Theagenes for entering the boxing competition merely to spite Euthymos. Furthermore, Theagenes did not box in the 76th Olympiad. Pausanias implies that this was what we might nowadays call "unsportsmanlike conduct." In addition to his two Olympic victories, one in boxing and one in the pankration, Theagenes won numerous victories in other games. 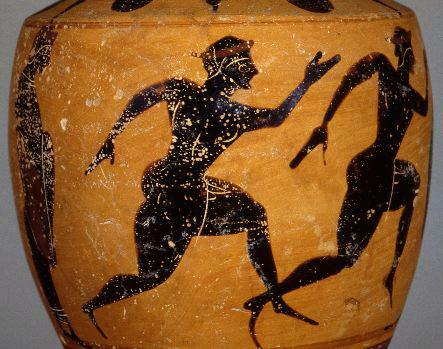 When he traveled to Phthia, the traditional home of the legendary hero of the Iliad, "swift-footed" Achilles, Theagenes decided to compete in the footrace. Of course, he won. Main panel: runner on left. Following his death, the people of Thasos memorialized Theagenes with a bronze statue. Allegedly, a man who never won a match against Theagenes came every night to the statue and beat it. One night, the statue came loose, fell on the angry opponent, and killed him. His sons prosecuted the statue for murder, a perfectly reasonable action under Greek law. (The Greeks felt that all murders must be punished, whether or not the murderer was a person, animal, or even an object!) The Thasians dropped the guilty statue of Theagenes into the ocean, presumably settling the matter. Then, in later years, famine and plague struck Thasos, and the people sought the advice of the oracle, who told the islanders to welcome back all exiles. The Thasians followed this command, but the crops still did not grow. Once more, they asked the oracle for assistance. The priestess replied that they had forgotten the great Theagenes. After some fishermen retrieved the statue of the athlete, the people of Thasos repositioned the statue in its original place, and they sacrificed to him as a healing god.